The first-person independent point-and-click horror game by Scott Cawthon “Five Night’s at Freddy’s” released its third game in the franchise on Monday, March 2. This is assumed to be the last game in the series, since upon completing the fifth night in the game, players are taken through a mini-game that ends with “Bad Ending” or “The End,” depending on if the gamer has successfully completed all the tasks necessary to complete the “good” ending. The “Five Nights at Freddy’s” series launched in August 2014, and received praise for its simplistic approach to the horror genre. Instead of playing a roaming character forced to confront evil, scary bad guys, gamers play as a stationary character, the night-time security guard, in a fictitious Freddy Fazbear’s Pizza restaurant and children’s attraction. The restaurant is a nod to Chuck E. Cheese’s pizzeria with animatronics similar to the ones Chuck E. Cheese’s used in the 80’s. When the game begins, the phone in the security guard’s room plays a message left by the previous night guard, known widely by fans as “The Phone Guy.” Phone Guy explains the basic premise of the game: Players are tasked to watch over the restaurant and the animatronics from 12 a.m. to 6 a.m. (each hour lasting a few minutes in real time), the catch being that animatronics have a “free roam” mode. This wouldn’t be a problem, unless the animatronics reach the security room and they mistake the player’s character as an endoskeleton of an animatronic, in which case they will try to stuff him into an empty animatronic costume. The costume has cross-wires and beams that will impale and kill whomever dons it. The games get progressively more complex each time, too. In the original “Five Nights at Freddy’s,” there are four animatronics to contend with: Freddy, Bonny, Chica and Foxy, each of whom has various “favorite spots” it likes to go to in the restaurant and a different level of aggression. Players must switch between viewing the security cameras to identify where the animatronics are and examining the hallways outside the security booth using a light switch. The only means of defense against the animatronics are two steel doors that can be closed to shut them out. Checking the cameras, using the light switches and closing the doors all require power, of which the character has a finite amount. At 12 a.m., the character has 100 percent, but each time players check a camera, slam a door, or use a light, it drains the battery. The game becomes about strategy, as well as the scare factor. By “Five Nights at Freddy’s 2,” players face the original four characters as well as four characters dubbed Toy Freddy, Toy Bonny, Toy Chica, and Toy Foxy, in addition to brand new characters Balloon Boy and The Puppet. The Puppet lives inside a jack-in-the-box in a kids’ play room, and its music box must be wound every minute or so. If it isn’t kept wound, the Puppet jump-scares the player and the game ends. Players can also “put on” a mask that makes their character appear to be an animatronic or use a flashlight to disorient an animatronic if it appears in the hallway and players have an infinite power source. “Five Nights at Freddy’s 3” is its own animal. There is only one animatronic, referred to as Springtrap. The location is still a Freddy Fazbear’s Pizza, but it has been converted to a horror attraction. The player must oversee the restaurant’s ventilation system, audio system and camera system on a panel, and one or multiple systems may crash and need rebooting at any given moment. The ventilation system will give the character hallucinations of animatronics from past games, which will not kill the character, but cue a jump scare and disorient and disable the player temporarily. The audio system plays a recording of a child laughing or saying “hello” and is used to lure Springtrap away from the security booth or into whatever part of the restaurant the player desires (although this doesn’t work every time). The camera system is what the player uses to see where Springtrap is. This game isn’t all jump scares, though. There is a story that unfolds through the course of these three games. 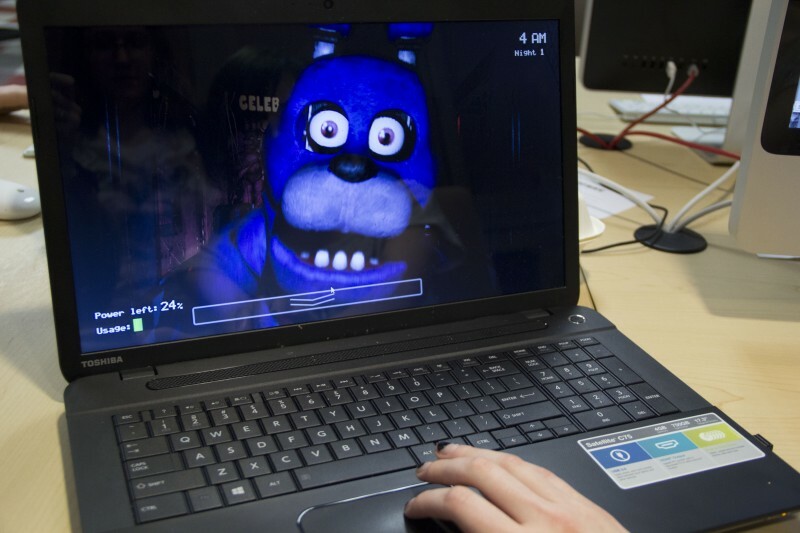 Through close examination of Phone Guy’s messages in the first and second games, minigame sequences that appear if the player is killed during the second game, and the secret mini-games in the third game, fans have theorized that the animatronics are possessed by the spirits of children who have been killed in the restaurant. YouTube channel Game Theorists studied several details of the first and second games, from the amount of money presented to players after the completion of the fifth night to the use of Atari-like minigames, and determined that the first and second games take place in 1993 and 1987, respectively. Furthermore, Game Theorists determined in their video for “Five Nights at Freddy’s 2,” that Phone Guy could be the one responsible for the murders of the aforementioned children. The gist is that “Five Nights at Freddy’s” is loosely based on real tragic events that took place in Aurora, Colo. at a Chuck E. Cheese’s restaurant in 1997 where an ex-employee of the restaurant murdered four of his former colleagues and his former manager and seriously injured a fifth victim. The second game provides evidence of the murdered children’s spirits haunting the animatronics and Phone Guy’s guilt through the minigames. Although Game Theorists haven’t released a video on the third game, fans have theorized that it may be the spirit of Phone Guy, or an unknown person who killed the children, that has possessed the Golden Bonny. “Five Nights at Freddy’s 3” takes place thirty years after Freddy Fazbear’s Pizza closed down, and it is known from the last message left on the phone in the first game that Phone Guy has been killed by the animatronics. The minigame at the end also shows a child or the spirit of a child making a man (presumably Phone Guy) climb into a Golden Bonny costume. Multiple play-through videos of each of the Five Nights at Freddy’s games can be found on YouTube, including ones by the enormously popular Markiplier and Pewdiepie. Additionally, Game Theorists and other fans have multiple videos out detailing fan theories about the lore of the world of “Five Nights at Freddy’s.” The game is available for purchase and download on Desura, Amazon and Streampowered, and a version for smart phones is available.